So after Kevin had fitted the alternator it was testing time for us.. The batteries had dropped to 76% in the morning and the first thing Al wanted to try was to get some more washing done.. Solar had kicked in and the batteries stayed at 76% so we got a free wash in. It then came for us to try the engine and check that things would be ok for cruising, so Del started the Beta, and the Sterling Power Ultra Pro 24/24 35A Battery to Battery Charger burst into life. The lithium batteries started charging fine with a steady 28.3 volts going into them. As we got to 98% you could hear the fluctuation of the engine beginning to kick in again, but it wasn't as bad as it was before the alternator was changed.. As we reached 100% the VE Bus control unit turned off the charging to the lithium batteries like it should, and all the lights on the charger were working ok.. It was saying high input voltage, but kept settling back down again.. to normal after about 15 minutes. It would then put a float charge into the Lithium batteries and go back into high voltage, at times putting 28.9 volts into them before the management system could turn the charge off.. Del slept on it and came up with this conclusion after not much sleep..
Del wasn't happy that we had not got the full Victron products fitted to Derwent6, and felt that over time the Sterling power charger (with an in built fan) would let us down, and to be honest it wasn't working as it should anyway. So a chat to the boss Adrian was arranged at midday.. He is a really nice guy to talk to and could fully understand the way we felt, so made a very good compromise for us to have a Victron 50A Buck Boost DC/DC charger with a very good discount..
One was ordered there and then and we walked away a lot happier.. So we now have to wait for the Buck Boost to arrive and lets hope its before Easter.. The good thing was that when we got back to Derwent6 the batteries were charged by solar and turned off for the day..
Al cooked a lovely roast chicken dinner and Tooty looked on in hope (behind the wine glass) and of course was spoilt..
We had a relaxing afternoon chilling out with the footy.. So it was an early start for us as Kevin said he would be in at 8.00am. He got started on fitting the 24/24/35 battery to battery charger and made up all new wires to do it. A board had to be fitted in a tight space where Del kept his tool boxes, but Kevin managed to get it in.. When starting the engine the charger burst into life, and it was programmed to charge lithium batteries, but it soon become apparent that the charging voltage was fluctuating, and the wrong lights were flashing on the charger as the load on the alternator altered. After some wiring testing at the alternator light, Kevin came to the conclusion that it must be the regulator in the alternator causing the problem.. So it was taken off and taken to an alternator specialist for testing. It wouldn't be ready for a couple of days. 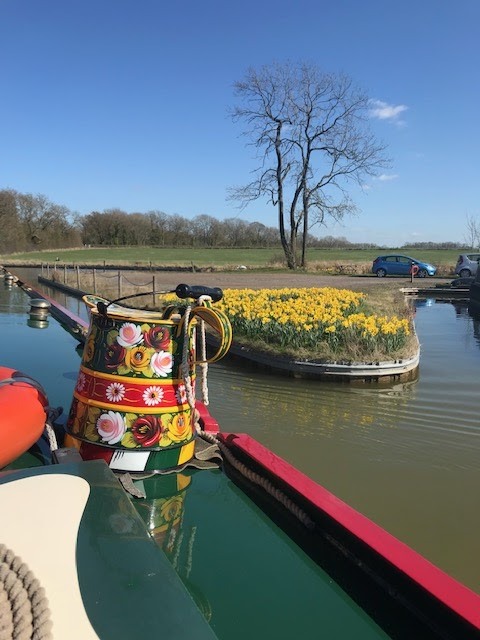 So the news is that we have a fantastic system fitted on Derwent6, but with no alternator to charge the batteries, and we still don't know whether this will fix the charging problem. Also Kevin is working abroad for two days so can't fit the alternator till Saturday morning. The good news is that we have been OFF shoreline now for three days and the batteries are still at 80% (26.4v) in the morning, and the solar panels charge us back up to 100% (27.2v) by midday, so we haven't needed our engine to charge the batteries.. So they are right, Lithium batteries are great if you can sort out the charging!!! Chuffed with our charged batteries we watched the football and when we went to bed the readings were back at 80%, but what was weird was that the solar controller had turned off and we didn't know why! We are still learning! So we were up this morning waiting for our battery charger to arrive. Del did all the brasses in the morning and it was a nice feeling watching the solar panels charge the batteries to full again after our uses last night..
We haven't had to run the engine since we have had the system fitted and there just seems so much more power. To be honest you always get that with any set of new batteries, so time will tell. The part arrived at 3.00pm but no time to get it fitted. Del was getting frustrated as he could have fitted it himself, but didn't want to jeopardise the warranty. So its time to see if the batteries hold up with a lot of power being used. Well day five went well, but there was still a lot to do... When we got round to firing up the new lithium's we had a fault code of voltage too high on the battery protect. It turned out (after an hour) that the auto setting hadn't detected the 24 volt system and we had to put it in manually.. Kevin ended up staying late as we still had to finish wiring up the solar panels and run a charge wire to the shunt from the alternator. When it burst into life it was amazing and the power felt different straight away.. 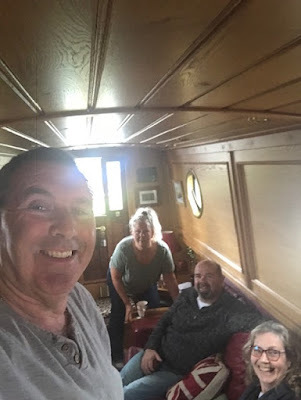 The water pump and toilet worked so much better and the lights in the cabin appeared much brighter.. We stayed on shoreline and Kevin adjusted the system for Lithium batteries and also adjusted the charge rates for the inverter for the batteries first charge.. The plan was he was going to come in the morning (even though it was his day off) and finish programming the system after its trickle charge all night. Kevin came in with his laptop and checked some things with us, running through the workings. He was a bit worried when he spotted the charge rate being produced by the 60 amp alternator. There had been a few alternators overheating and he wanted to fit a BMS 12v/200a, but Derwent6 is a 24v system.. He told us to stay in the poly tunnel over the weekend and he would give it some thought.. So we used the time wisely and took off the cratch cover and gave it a good scrub up, and then sealed it. We also did a load of other jobs while we had the chance. We got a phone call from friends Maxine and Graham, who were in the area, and met them at the top of the road to go to the Greyhound pub at Sutton Stop. They turned up in their new campervan and what a lovely bit of kit it was..
We went to the pub and had a lovely meal and a good catch up.. They parked their camper van in the carpark for the night and we got a cab back to Derwent6. In the morning we met up again at the marina, and they kindly brought crumpets and Hot Cross buns with them. It was lovely to see them and I'm sure we will be meeting up again, as they can park in the middle of nowhere where we like to moor. After they had gone we carried on with some jobs, oiled all the cratch boards and enjoyed our new system..
On Monday morning Kevin told us we had to come out of the polytunnel as it was booked from today for two weeks. This was great as we wanted to try out the solar panels and see if Derwent6 could hold its charge as we tested everything.. The day was a bit cloudy, but the batteries were holding their own as we used pretty much as much as we could.. So Kevin had come up with another solution, fitting a battery to battery charger so we could reduce the alternator output, turning it into a variable voltage to charge and float the lithium batteries. This could be turned on and off by the management system.. This part had to be ordered so we were going to be in here for another day at least..
We used the time to play with our new toy and we've got to say we were well pleased with how things were performing..
We had a storm late in the evening, so it was solar panels down, and went back on shoreline so we could get the washing up to date.. So it was a slow start this morning, but the carpenter Steve finished the trim where the solar panel wiring has come through the roof. The engine room was a mass of wires, so it wasn't even worth taking a photo. The good news is that a fair bit did get done in the afternoon and we should be close to getting things turned on tomorrow.. We haven't had to worry as we have been given Shoreline while all this is going on. It has been really cold and wet the last couple of days, but it has been warmer in the polytunnel. So what is left to do? Well we have all the negative side of the circuits to do and also the charging wire from the alternator which needs changing.. The MPPT and the solar wiring need to be finished and also the monitors wired up.. Then it is just a case of tiding all the wiring up and then programming and updating the system, linking in with our phones so we can see what is going on all the time.. Looking forward to a good day tomorrow! So it was a 9.00am start again today and the new lithium LiFePO4 batteries were waiting out on the pontoon waiting to go in. The first job was to remove the old batteries (well four of the six) and remove the wiring.. The second job was to make up the new battery wiring from 35mm to 50mm and then to get some insulation round and under the battery carrier to try and keep the batteries as warm as possible even in extreme conditions. The batteries were then fitted along with the VE Bus controller, which is part of the management system which looks after each individual cell in the batteries. It looks at high voltage, low voltage, and high temperature. It also balances the cells so that they are even and will shut down any loads which will drop the voltage in a cell, too low.. If the cell gets too high (over voltage) it will shut down the charge voltage coming into it either from the alternators, solar panels or from the inverter. The worse thing is that Lithium batteries do not like being charged under a temperature of 5 degrees.. So the Management system will disconnect charging circuits if the temperature is too low.. As you can see from the picture there are two lead acid dump batteries still fitted.. 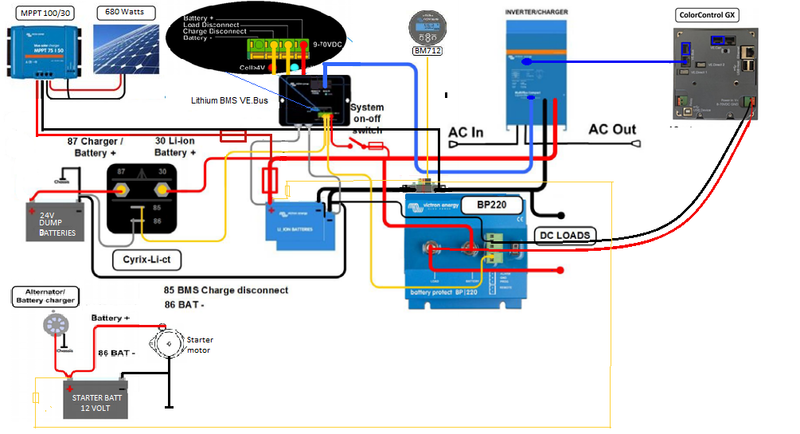 This is to take the charging voltage from the solar and alternator when the lithium's batteries don't need to take a charge. Lead acid can be charged all the time. Del tried the tilt on the solar panels today and they look big, but fantastic. It will be very interesting to see what they will produce on a cloudy day.. We are hoping to be able to leave them down in the summer months, as the sun goes right overhead, but if required we can catch the last rays of the day as the sun sets. In the winter, with a low sun all day, hopefully the tilted panels will come into their own. A panel was then made up with a battery protect controller and also a relay which turns on and off the charging circuits. Also they are protected by fuses, and then you have the shunts and buzz bars which gives us all the correct readings on the display panels.. If you remember Del fitted a new fuel pump to the Eberspacher central heating and it still didn't work but put a trouble code in for an open circuit in the glow plug. He fitted it late in the evening, as it was going to be another cold one, and after a few times trying to get it to work it burst into life with a puff of smoke.. another job, jobbed! We woke up to rain on the roof and Del went out and opened the back doors and the hinge snapped. This has happened before and the last time we fitted stainless steel hinges. They have lasted a lot longer than the brass ones which only lasted two years..
Del was out in the rain trying to get the broken bit out of the hinge but managed to get it out in the end.. We now only have brass spares so I'm sure in a couple of years we will be doing it again. Also the central heating fuel pump turned up and Del fitted that, but to no avail, it still didn't work. When we checked on line it was producing a trouble code which said it now had a fault with the glow plug, so we ordered one of them at £50 quid.. The good news is that it looked like the glue for the solar panels was dry before the rain and the guys were cracking on with the battery management system.. We had to remove the 35mm battery cables and replace them for 50mm cables as we are now fitting a 3000kw inverter. 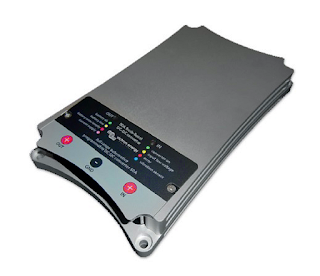 This Inverter has more capability to do firmware updates when required.. This meant that a lot of the covers in the engine room had to be taken out and we didn't have the space to put them anywhere, so we had to move.. The polytunnel next to us became free so we reversed Derwent6 into it so we were in the dry.. The tumble drier had to be removed and also all the engine covers as the wiring ran tight along the front of the engine.. This gave Del a chance to check the crankshaft pully again and also run the hoover round all those places full of dust. Al meanwhile had ordered a Tesco's delivery and loaded up the cupboards with goody's.. So most of the heavy wiring was done, and a couple of monitors and the new inverter fitted, and by the evening we were back on 240 volts but still on the old batteries, new ones will be fitted tomorrow.. So if anyone is interested we have a 24v/2000kv/50 inverter for sale which we have to say has been a very reliable piece of kit..
We were up early and pulled into Springwood Haven marina at 9.00am. They had sorted us out a slot and we reversed up on it. It was a lovely day again and we waited for Kevin to get us started by getting the solar panels. We soon had the brackets fitted to them and then four holes were drilled into the roof.. The feet were then glued to the roof and security bolts fitted. We were really pleased with the results..
We then run some wires in the engine room and sorted out where things were going to go for fitment tomorrow.. It has been lovely the last few days so Derwent6 got a good polish. It also gave us some time to clear out the cupboards in the engine room. Del also found water in the bilge which turned out to be the weed hatch drain tubes blocked.. The button on the bow got straightened and the prop got polished, yep polished.. We were getting a lot of wash from the prop after Derwent6 had been in a marina for six weeks.. When you felt it you could feel a roughness on the blades which was causing drag in the water and not giving the blades that cutting edge.. Just a good rubbing down with some wet and dry sand paper and it was like new again.. 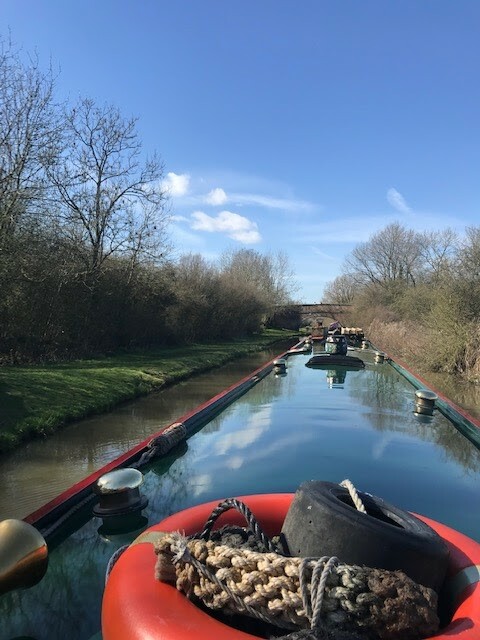 So the reason for clearing out the engine room is so we can have the new lithium batteries fitted and also two 340 watt solar panels fitted on the roof.. We are booked in tomorrow and can't wait to give Derwent6 an upgrade.. I think we have said before that this is not just a battery upgrade because you have to fit a management system to protect them.. The diagram looks something like this and will be linked to an app on the phone to monitor what is going on all the time.. It has involved a inverter upgrade and also all the wiring has to be able to take heavier loads so needs changing. So we will try and fill you in with what goes on. Wow it was a lovely day today, and we intended to make the most of it..
Del was up early and making up some kindling and looking for wood..
We were then hit by girl power.. Sarah came by with some crew we knew from years gone by.. It was Lesley and Amanda who were out on a trip with Sarah on her boat n.b Enceladus. We had a good old catch up..
We then walked over to Springwood Haven Marina and picked up our Solar panel brackets.. Yes Solar! Derwent6 is having Solar panels covering up that shiny roof. The time has come!! Del put the brackets together and set them up to see what they would look like.. What do you think! We sat in the cratch for the first time this year in the sunshine.. Bring on the Summer! Oh and we have ordered the fuel pump for the central heating..
After a day of chilling out and still catching up with jet lag, we set off early today with the intention of going all the way to Hartshill. It was quite cold on the stern deck as we idled along till we got to Rose's narrowboats. Al opened the swing bridge and we were soon on our way.. It was nice to see all the wild life again using the canal like us. We made our way up to Sutton Stop and filled with water just to keep us full. We then went through the lock and took the turn onto the Coventry canal and headed north. 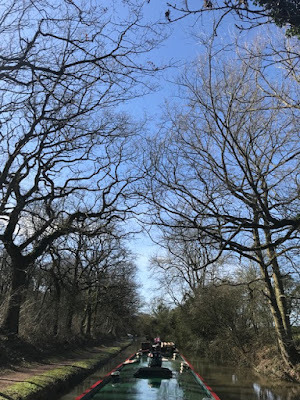 We passed the junction with the Ashby and pushed on towards Nuneaton. We were surprised when we got to Nuneaton to see how things had gone downhill again with the rubbish in the canal and the graffiti on the bridges. It must be so depressing for the locals with the country not in a good place at the moment. We were pleased to get through without any prop damage and managed to get to a nice mooring in the middle of nowhere. Del was soon out doing the brasses and Al sorted out the interior of Derwent6. We are here to have our new batteries and solar panels fitted so watch this space! Derwent6 is due an upgrade. So its back to reality (and our reality isn't that bad). We have really suffered from Jet Lag and have been waking up at 1.00 or 2.00am, so we have been walking round like zombies for most of the day.. Well Derwent6 was a little worse for wear when we got back and a lot of work was needed. 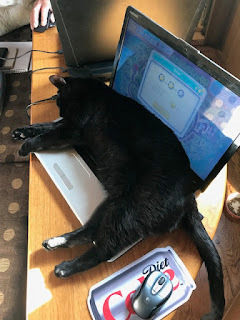 We would have sorted out the blog earlier but Tooty had other ideas after leaving him for so long. We also found that the central heating pump had given up the ghost so we relied on the good old wood burner to heat up Derwent6. Al put all the sheets in the tumble to warm them up and we soon took all the coldness out of the woodwork. We filled up everything after it had been drained for winter storage and got ourselves ready to go. It was so good to be going out of the marina and feel D6 on the cut once more. We again realised how lucky we are to be doing what we are doing travelling these different worlds. We didn't go far, we just wanted to be self sufficient again. Its so nice to be HOME! !